I unexpectedly encountered C.S. Lewis while unpacking a box today. I’m ashamed to admit it, but five years after moving into our retirement home, I have yet to unpack half of my library. The text that stood out among the two score volumes restored to the light today is called The Cult of the Superman. It was written in 1944 by Eric Bentley. I have yet to find the time to read the volume, but it’s subtitle clarifies the profound subject it addresses: A Study of the Idea of Heroism in Carlyle and Nietzsche, With Notes on Other Hero-Worshippers of Modern Times. Thomas Carlyle and Nietzsche, in elevating the exceptionality of the hero or superman who “shapes history,” diminish the value of the vast majority of human beings who seek no such domineering role. This view, so warmly embraced by the Nazis, is directly opposed to the Christian worldview. The news that God lifts the lowly will come as a disappointment to any supermen or superwomen who are reading this. In his “Appreciation,” Lewis declares that Bentley is the right man to address this challenging topic. The Author, though sternly critical, has a sympathy which I cannot emulate with those elements in Heroic Vitalism which really deserve a serious answer, and this enables him to make a constructive book out of what might easily have become a mere chamber of horrors. Coincidentally, as I was writing this column, “Fishers of Men” by The Newsboys began playing. The first lyrics in the song coincide perfectly with the biblical promise above that every single person—including you—is precious to God. And they all mean the world to You. So much for those who would consider themselves super-men . . .
* Lewis’ praise for Bentley’s work is also found in a letter included as an expression of appreciation in ‪The Play and Its Critic: Essays for Eric Bentley. Dissent and debate were seen by Lewis as a method for testing ideas, and so he felt that discussion of an ideological sort could only strengthen a grasp on truth. . . . It is possible, then, that Bentley’s positive attitude toward conflict and its necessary presence in a pluralistic, growth-oriented world was learned at Oxford. There is a yearning in our culture for the superman….consider the great number of superhero Marvel films (and others) and the songs (Eurovision winning song this year included). How to bend people’s attention to the one real superman/God-man, Jesus? True. We do desire a superhero who can overcome the daunting threats of this world. Yet even the fictional characters of the Marvel and DC “universes” are concerned about others. 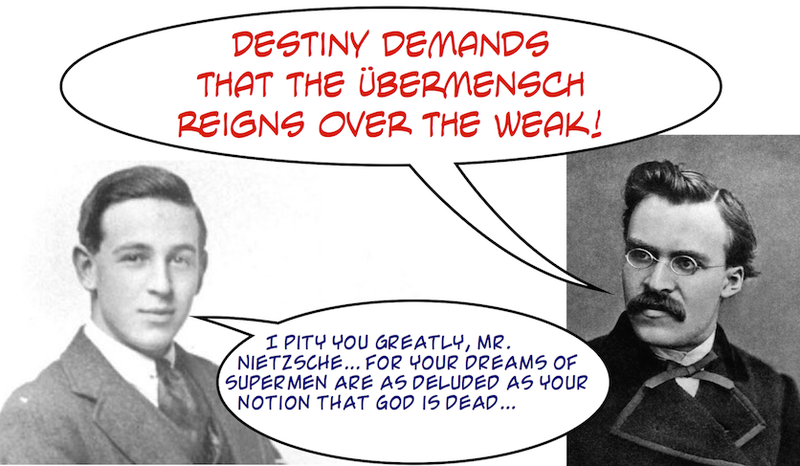 They are not the übermensch of the atheist philosopher. Having relocated once too often, my husband and I can testify to the inherent angst of unpacking boxes of books, old friends that now will inhabit new places. “But it will be like unwrapping Christmas presents,” a mover told me as I watched the boxes stack up. Actually not a bad way to trick yourself into looking forward to it! It really is like that… especially when the boxes sit for a decade before “unwrapping.” I encounter so many surprises when I open them. Last night I found a stack of ministry folders I had meticulously begun assembling as a pastor. I said to my wife, “you know, these would have been truly useful if the internet had never been invented.” Needless to say, most of the articles therein are scheduled for recycling. Well said post. With so many words being tossed around and repurposed these days , it’s good to consider their actual meanings and purposes. I definitely do love the ability to scan and maintain digitally material that would easily be lost or misfiled. Just seems to take such a lot of time to scan any “quantity” of materials. We have eaten of the forbidden fruit. We have knowledge of good and evil. We are different from the animals. But is the criminal that believes he is a wolf preying on sheep any different from an animal? Does he have knowledge of good and evil? Since I believe the “we” with which you begin represents all of humanity, the answer to your final question is “yes.” Even if it comes only from the “natural law” (in the theological, not biological, sense) inscribed within their being, people can tell the difference between light and dark, and their cruelty and evil actions are inexcusable. There are cases, of course, where we say that someone is “without a conscience.” The truth is that their conscience has been so suppressed, and/or warped, that they function in a way utterly contrary to those with an “active” conscience. Nevertheless, they still possess that distinction which separates us from the beasts, corrupted as it may become.